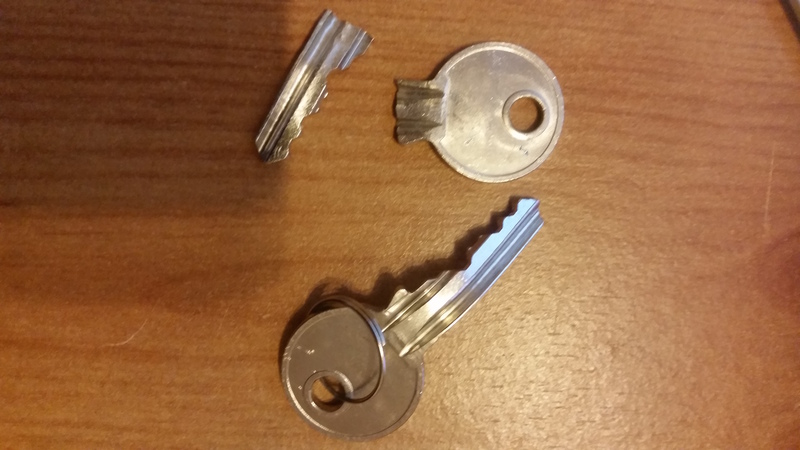 Your key snapping in the door can happen to just about anybody and for some apparent reason it always seems to happen at bad times but here at James Locksmith Cardiff we will be with you as quick as possible to help out. There are certain factors as to why your key has decided to snap but some unfortunate times there could be just about no apparent reason, other than just really being very unlucky. Due to the key snapping you may think your fortunate to have a friend or relative near by with a spare in there possession but as you have the broken key stuck in the lock the spare won't work. To extract the broken key demands a locksmith in cardiff as extraction of the key is tricky and requires special precision tools and some patients. 95% of times extraction of broken keys is possible but on rare occations destructive methods are needed and a new lock may have to be installed but this is only in extreme circumstances. If for any reason the key in the door which is snapped is the only key you have, We will use our knowledge of locksmithing and open the door with our incredible set of skills and then change the lock with one which you require with a set of new keys from our stock. If you have snapped your key in your door no matter what time of day or night, phone James your Locksmith in Cardiff for a free no- obligation over the phone quote as I'm sure we will be able to help. Why not opt in to a year subscription of 24 hour insurance for lock out's which would save save on average of £200 for 3 callouts of maximum use. If you are aware that the key you are using is damaged in any way and you continue using it knowing that it has been dramatically week'n you are asking for trouble, due to these keys only having a thin piece of metal binding the cuts for the pins or leavers together. James Cardiff Locksmith highly recommend that you instantly stop using this key and get a new one made. Worst case is you only have the damaged key available to copy and a copy of it can't be made as the damage is significant. Which means a new lock would be the option best suited which would come with new genuine manufacture keys and brand new working parts which are not worn from years of continuous use. A new lock being fitted would be considered to be a lot cheaper than phoning for a Locksmith in Cardiff at unsociable hours after the key had failed in the lock. Locks seizing up and failing is not uncommon. When you think of a lock and how many times it is used for example the average person opens the door in the morning USE 1, Locks it as they are leaving to go to work USE 2, Comes home to re-open the front door after work USE 3, Then locks it as they go to bed USE 4. This is based on 1 Day but times the 4 uses of the lock a day over a period of 365 days for the year would give you a total of 1460 uses of that lock. At some point all locks fail and 90% of the time they give you some indication that there life span is up.